The Artificial Saliva products are prepared according to DIN 53160, AFNOR NF S91-141 and the FUSAYAMA/MEYER Artificial Saliva formulations for testing of dental metal alloys and colorfastness of oral products. Custom formulations are available. These products do not have a preservative and should be kept refrigerated. This Artificial Saliva is prepared according to AFNOR NF S91-141 standard procedure and is intended for testing biodegradability of dental metal alloys. The formulation consists of two parts that are mixed right before use. This minimizes changes in the solution during storage and allows for a longer shelf life. The pH of the solution after mixing is 7.8 +/- 0.1. The Artificial Saliva should be stored refrigerated both before and after mixing. Premixed, ready-to-use solution is available upon request. This Artificial Saliva is prepared according to DIN 53160-1:2010-10 standard procedure. DIN 53160 specifies the method to determine colorfastness of products intended to be taken into the mouth. The formulation consists of two parts that are mixed right before use. This minimizes changes in the solution during storage and allows for a longer shelf life. The solution should be stored refrigerated both before and after mixing. The pH of the solution after mixing is 6.8 +/- 0.1. This Artificial Saliva is formulated according to literature for pharmaceutical research such as studies of drug dissolution and drug delivery through oral mucosa. This is a ready to use formulation that should be stored refrigerated. The pH of the solution is 6.8 +/- 0.1. This Artificial Saliva is formulated according to literature references for medical and dental research. This formulation has similar composition to commercially available products used to treat dry mouth and other conditions. This ready to use solution contains Sodium Carboxymethyl Cellulose to increase viscosity of the solution and make it behave similar to natural human saliva. 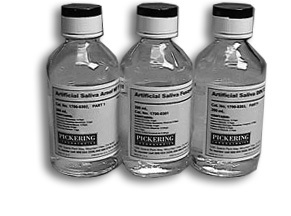 This formulation can be stored at room temperature and has pH of 6.75 +/- 0.05. But this solution is only intended for product testing and research, and not for medical use.